Yellowed black and white image of five women standing in a row. All wear dresses of varying styles. Their hair is shorter and curled on the bottom. Three of the women wear glasses. 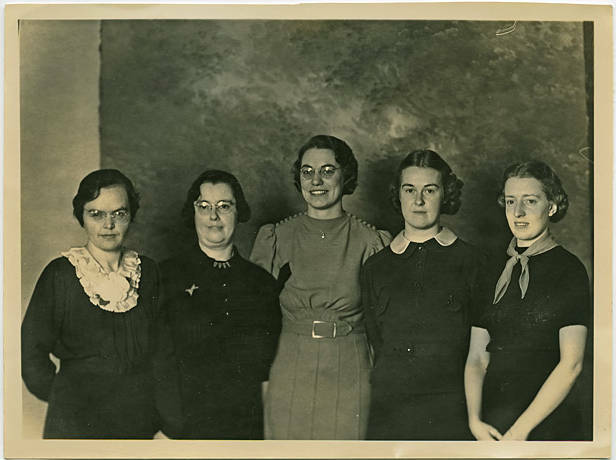 Museum records identify these women as employees of Commercial National Bank, which occupied the building where the U. S. Bank is now in downtown Hillsboro, on the corner of 2nd and Main Streets. [back] [pencil] One of this & other pose.